Here let’s take a deep dive into some of the Digital Field Inspection Form Advantages for growing businesses. In the restaurant and hospitality industry, change can be a difficult prospect. Moving from existing processes to new ones is a daunting task for management to plan and execute on. When factoring in the impact to both current and new employees, organizations must have proper operational systems in place. These systems are not only necessary prior to impactful change but are the key to creating a standardized approach to maintain brand and structural consistency. So, the question now becomes, how does a small or large company ensure that they are creating a replicable model, that is adaptable and flexible enough to manage future change? While there is no simple answer to this question, the best place to start is with a well thought out and organized digital Operational Assessment Form. Using these Operational Assessment or Field Inspection Forms, management can learn which areas of their operations are successful, and what spots can be improved through data and analytics collected. 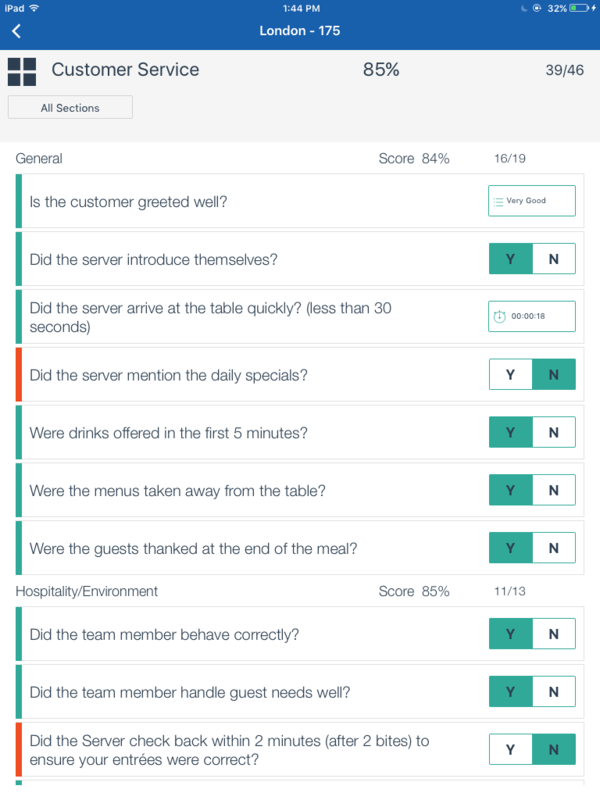 A digital Operational Assessment Form can range from an exhaustive list outlining the various components of a restaurants Back of House (BOH), Front of House (FOH) or general facilities. The key to any growing chain businesses, is the ability to maintain a consistent experience for customers. Whether they are a bar, restaurant or hotel, a customer’s anticipation of an identical experience each time they visit the brand is what sets the backbone for customer loyalty. Regardless of the geographical location they’re at, the familiarity is what drives them back each time. This is where having a complete Field Inspection Form is tremendously important. These forms are used to document and analyze how locations are complying. Each area of the business should have well thought out operations, with deliberate intentions of creating the best possible experience for their customer. Bathrooms, light fixtures, fridge temperatures and even the cleanliness of the glass at the front of the store will factor into whether a customer will return for another visit. When/How are these assessments done? For each organization, the size, both in terms of number of locations and financial standing can determine the support team required to manage operations efficiently. In many organizations with 20+ locations, there are district managers responsible for specific segments or groups of stores. Sometimes divided by geographic region or chosen for other strategic regions, these district managers visit stores regularly. Regardless of the frequency, whether it is bi-weekly, monthly or quarterly, a regional manager must conduct these assessments in order to verify that each location is operating to the standard and expectation of corporate management. In Franchise models, this practice is even more important. When a franchisee opens a new location, they are effectively purchasing the tools, guidance and infrastructure to be successful with what they believe to be, a proven product. To ensure this, corporate managers must assist in their operational execution not only for the benefit of the franchisee but also to certify that this new store is representing the brand as the corporation intended it to be. With each assessment collected, the quantity of data collected grows. This can in turn be analyzed to show both on an organizational and location specific basis what areas are operating successfully and unsuccessfully. The outcome here can be vastly important to improving the bottom line for your brand. Currently, many individual and multi-unit chains use paper and excel to conduct these Field Assessments. This is a problematic approach for managing such a crucial component of business operations. 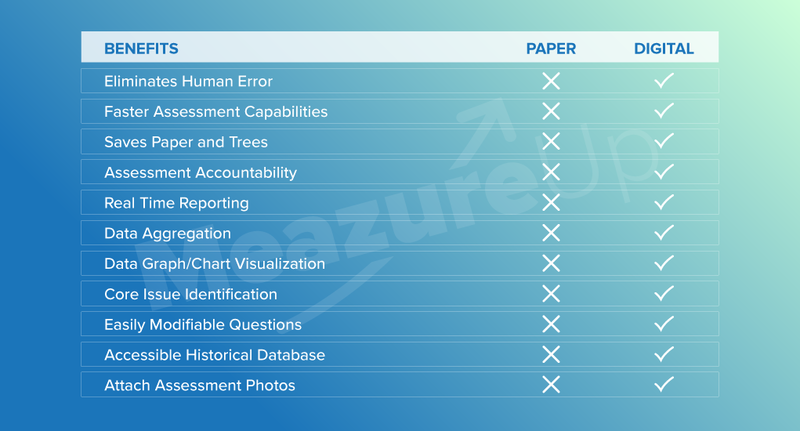 A Paper and Excel process is time consuming, offering poor tracking and zero visibility into business trending. It is critical for any organization to have the ability to identify issues happening, so that they can fix the situation in a timely manner, ultimately ensuring the best possible experience for their customer. Check out how renowned Chicken chain, Golden Chick improved their process after moving to digital with MeazureUp.